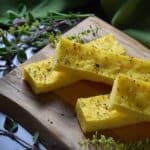 Rustic Polenta Pizza with Herbs will quickly become one of your favorite sides. Can easily be topped with all your favorite fixings! Preheat oven to 400° F. Position rack in the center. Drizzle about 1 tablespoon of olive oil on sheet pan. Set aside. In a medium bowl, combine both kinds of cornmeal. Set aside. Add salt and 2 tablespoons olive oil. Whisk in the cornmeal and stir for about 5 minutes or until thickened (the water will be absorbed). Spread on greased sheet pan to desired thickness. Drizzle with 1 tablespoon of olive oil and top with your favorite herbs. Gently poke the polenta with your fingers to create a "dimples". Bake at 400° F for approximately 30 minutes. Lower heat to 375° F and continue to bake for another 20-30 minutes. Allow to cool and cut into pieces. When cooking polenta, be careful not to burn yourself as there are bursts of air which escape from the mixture...no casualties please.